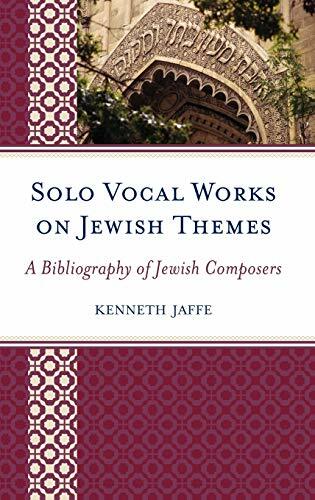 Solo Vocal Works on Jewish Themes: A Bibliography of Jewish Composers is a comprehensive and annotated compendium of stage, concert, and liturgical compositions written by Jewish composers from every known time period and country. Kenneth Jaffe has amassed nearly 3,000 large-scale musical works for solo voice(s) on Jewish themes, written by Jewish composers. The works include over 400 cantatas, 150 oratorios, almost 300 operas, more than 100 sacred services, 20 symphonies, and more than 350 stage works, including Yiddish theatre, Purim and sacred plays, multi-media pieces, and musical theatre. In addition, original song cycles and liturgical services arranged for a modest to large complement of instruments are also included. The works are organized by composer and subdivided by genre, and each entry is fully annotated, detailing the title, opus, voicing and instrumentation, text source, commission, year completed, year and location of the premiere, the year of publication and the publisher (if any), the location of scores, and the duration of the work. The works are then broken down by theme, such as Biblical themes, works for children, works of the Holocaust or Jewish suffering and persecution, interfaith works, and wedding music. They are then cross-referenced by voice type, arrangement, and by title. A list of libraries and publishing houses of Jewish music rounds out this invaluable reference. Kenneth Jaffe is cantor of Temple Ner Tamid in Downey, CA and has served Jewish congregations throughout the United States as an invested Cantor of the Reform Movement.